When adding a file to Enterprise, it needs to be made part of the structure that has been set up in the system. This is done by assigning it to a Brand and optionally an Issue. Furthermore, a file can be added to one or more Dossiers and one or more Tasks. Various scenarios exist in which the name of the file that is added is identical to the name of a file of the same type that already exists in that location. For all other files types, files of the same type and with the same name can be uploaded to the same Issue. 1. A layout named 'my-layout' is assigned to Issue 'A'. When assigning the same or another layout named 'my-layout' to Issue 'A', this is denied. 2. An image named 'my-image' is uploaded to Issue 'A'. When uploading the same or another image named 'my-image' to Issue 'A', this is allowed. 3. A Dossier named 'Story 1' is created in Issue 'A'. When uploading a layout named 'Story 1' to Issue 'A', this is allowed. Note: By 'file type' we mean the groups of file types that exist in Enterprise, such as articles, images, audio files, and so on. This means that uploading an image in JPEG format is handled the same as uploading an image in PNG format because they both belong to the same file type group, namely 'image'. The reason for not allowing duplicate names for the mentioned file types is that such files are directly related to a particular story. A Dossier for example represents a unique story, and having multiple Dossiers with the same name within the same Issue would not make sense because it would imply that the Dossiers are about the same story. This automatic renaming is done by Enterprise by adding a numeric postfix to the file name (such as '_0001'). A typical scenario where this rule is useful is when adding 2 images with the same name but in different image formats to a Dossier, such as 'my-file.jpeg' and 'my-file.png'. Without the rule in place they would both be added as 'my-file'. With the rule in place, the first file is added as 'my-file' while the second file is added as 'my-file_0001'. 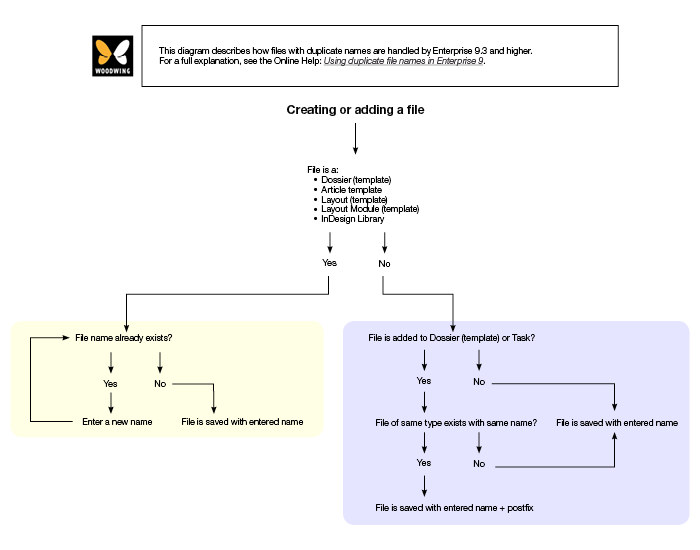 If for some reason you don't mind that files of the same type and the same name are shown with duplicate names in a Dossier or Task (for example because you use the Format column to keep track of what file type each file is in), then you are free to restore the file name to its original name. Step 1. Access the Properties dialog box for the file. 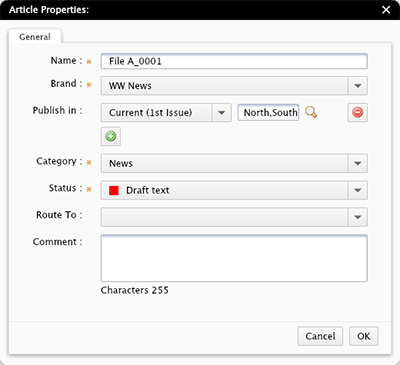 Figure: The Properties dialog box in Content Station. Step 2. Remove the postfix from the file name. Example: Remove '_0001' from the file name 'my file_0001'. The file is saved with the entered name even when a file of the same type already exists with that name. Tasks are typically set up to have specific users provide files for a story. Example: A Task is allocated to a photographer who subsequently goes out and makes photos of a particular subject and adds the photos to the Task. Tasks also act as individual containers within a Dossier. At some point, the files in the Task will be made part of the Dossier itself. In this scenario, Enterprise allows duplicate file names to exist.